Whenever awards are handed out by one's peers, it is often said that it's an honor just to be nominated. Nowhere is that more true, perhaps, than in Blawg Review, where a different host each week recommends the best recent law blog posts for everyone's attention. At year end, we take a break from our regular issues of Blawg Review, while Lady Justice passes judgment on law bloggers who, for better or worse, caught her eye as she peeked from underneath her blindfold. In this image, I wanted to continue the humorous aspects of Dan's writing, so here we have She-Hulk as "Lady Justice". Of course, Justice is supposed to be blind, and she is peeking! For those who don't know, She-Hulk's real job is a lawyer, and she is always using her super-abilities to her advantage in her cases (or else she is getting herself in trouble with the judge!). Anyway, I am signed on to do these covers indefinitely, so there should be a lot more big beautiful greeness in our near future! The Art of Greg Horn collects 144 pages of Greg's best paintings from comics, video games, and advertising! Also included is a painting tutorial and many behind the scenes tales of his comic industry adventures. Available as a hard cover with dust jacket or trade paperback version, this book makes a great holiday gift for someone you love (or just like). The name and likeness of She-Hulk is a trademark of Marvel Characters, Inc., and Marvel is bringing this character back in a new series of comics, including the 25th anniversary issue, featuring outstanding new cover art that is copyright by the original artist Greg Horn and/or Marvel. A few low resolution digital samples of these illustrations are included here in the context of our review and recommendation of this publication for lawyers and their families, which constitutes fair use. Please show your appreciation for this new cover art by clicking the illustrations and visiting Greg Horn's website to see more of his art, including a new book, which looks fantastic. But I digress. Themis, the Goddess of Justice and Law, is well-known for her clear sightedness. She typically holds a sword in one hand and scales in the other. The scales represent fairness and balance, and the sword signifies the power that is held by her making the decision. Justice is not blind; the blindfold, representing the impartiality with which justice is served, is a relatively late addition to the imagery of Lady Justice that "became a more common motif during the 17th century and after, when the idea began to take hold that the judiciary should stand apart from the sovereign. Justice blindfolded can't see the signals a sovereign might send on how to rule in a case." As you may know, Themis had three attendants, minor gods of the Underworld, who also acted as judges over the souls of the dead. Any similarity between those three attendants and Blawg Review's Contributing Editors, Kevin Heller, Mike Cernovich, and the Legal Underground's Evan Schaeffer, is purely coincidental. They, who contributed substantially to the regular issues of Blawg Review throughout the year, are in no way responsible for the inclusion or exclusion of anyone's law blog in these Blawg Review Awards. This year's Blawg Review Awards are judged and decided solely by Themis. You may agree or disagree with her decisions, and we trust that some of you might have a lot to say about these Blawg Review Awards on your own blogs. If you would like to acknowledge other award-worthy blawgs, by all means don't hesitate to invent some new award categories and wield your authority like a law blogger by giving awards to your personal favorites—maybe even giving yourself the award you deserve. But no amount of influence in the blogosphere, nor any number of friends voting for your law blog, gets you one of these statues. We simply don't have the budget for such exquisite trophies in our first year of Blawg Review. Someday—maybe when pajama blogging is as lucrative as mainstream media—we might present some real hardware with Blawg Review Awards, and award-winners will be entitled to display an exclusive graphic on their weblogs. Now, without further explanation or reasons for judgment, we present the winners of this year's Blawg Review Awards. Colin Samuels, at Infamy or Praise, receives the highest praise for extraordinary achievement as the host of Blawg Review #35, which is named officially the Blawg Review of the Year 2005. David Lat, at Underneath Their Robes, picks up this year's Blawg Review Award for Persona of the Year for Article III Groupie, affectionately called A3G by some judges. The award for Intelligent Design is presented to Monica Bay for the Common Scold, which has evolved into quite the specimen blawg. J. Craig Williams receives this year's award for Best Graphics on a Law Blog for the gorgeous redesign of May It Please the Court. The award for Best Blawg Theme goes to Patent Baristas, which presented a strong showing in the graphic design competition, as well. Best Tagline goes to law student Jeremy Richey's Blawg, which gets the award for "When I'm not pounding the books, I'm pounding the law, the facts, or the table." Between Lawyers gets the award for Best Group Blog by Lawyers. Crescat Sententia wins Best Group Blog by Law Students. The Volokh Conspiracy takes Best Group Blog by Law Professors. Douglas A. Berman gets recognition for the Best Blawg by a Law Professor for Sentencing Law and Policy. Ambivalent Imbroglio is awarded Best Blawg by a Law Student. Evan Schaeffer receives the award for Best Blog by a Practicing Attorney for The Illinois Trial Practice Weblog. Patrick Lamb picks up the award for Best Practice Management Blog for In Search of Perfect Client Service. Branham & Day gets the Law Firm Blogs Award for coordinating these diverse practice specialty blogs: Tennessee Business Litigation Blog, Day on Torts, Med Mal Blog and erisa on the web. The nod for Best Politico Blog by Lawyers is given to both Daily Kos and Power Line, who will probably take opposite positions about which deserves this award most. SCOTUSblog is judged the Best Law Blog by a Firm. Harriet Miers's Blog!!! gets the award for Best Judicial Nominee Blog. The award for Best Blogging by a Judge goes to Richard Posner for the Becker-Posner Blog, but there could be another contender if this judge ever starts blogging. The award for the Best Special Interest Blog by a lawyer goes to Professor Bainbridge on Wine. Scheherazade is recognized for Best Personal Blog by a legally-oriented female blogger for Stay of Execution. George M. Wallace, gets the award for Best Personal Blog by a legally-oriented male blogger for A Fool in the Forest. Jen Burke gets the award for Equal Justice for Transcending Gender. ProfessorBainbridge.com® takes the much-coveted law blog award, Best Eclectic Blog. Jeralyn E. Merritt gets an Award of Merit for TalkLeft, a criminal defense attorney's blog that makes Jennifer Walters green with envy. Video Game Law Blog is the judge's choice for Specialty Blawg. The award for Best Blog By An Out-of-Practice Attorney goes to Anita Campbell, a former General Counsel, for Small Business Trends. Sabrina I. Pacifici's beSpacific gets the award for Legal Support Blog. Evan Schaeffer's Legal Underground gets the award for Community and Social Interaction on a law blog, a.k.a. the award for the Most Fun in the Comments on a Blawg. Denise Howell of Bag and Baggage receives the award for Blawg Diva, a very special honor. Carolyn Elefant of My Shingle is recognized with a Lifetime In Blog Years Achievement Award for three years of inspiring solo and small firm lawyers with her blawg. Concurring Opinions is recognized as the Best New Blawg in 2005. Professor Orin Kerr at The Volokh Conspiracy shares the Blawg Review Award for Legal Reasoning with John Hinderaker of Power Line. Tom Kirkendall picks up the award for Best Blawg With Local Flavor for Houston's Clear Thinkers. Ernie Svenson gets the Blawg Review Award for Best Perspective on the news story of the year, Hurricane Katrina, for his excellent writing on Ernie the Attorney. The award for Breaking Law News is given to Howard J. Bashman for How Appealing. Lisa Stone at Inside Opinions: Legal Blogs is recognized for Blog Journalism for legal blog watching and support for Blawg Review, not to mention her outstanding work organizing BlogHer and judging the BOBs. The award for Best Online Law Magazine using blog technology goes to Point of Law. Law bloggers Robert J. Ambrogi and J. Craig Williams share the award for Best Legal Podcast for their weekly internet radio show, Coast to Coast. Glenn Reynolds gets the Grand Panjandrum Award for Instapundit and his eponymous blog, GlennReynolds.com, and for being called the Chair of the Advisory Board of Pajamas Media. TechnoLawyer gets kudos for the 2005 TechnoLawyer @ Awards, the other most comprehensive set of awards in the legal market. And, finally, the award for the Best Blog Carnival for Everyone Interested in Law goes to—you guessed it—Blawg Review. That's all she wrote. Editor's Notes: In 2005, there were many excellent presentations of Blawg Review, #1 to #37, each different from the others and all of them very special in their own ways. If you enjoyed reading Colin Samuels' award-winning Blawg Review #35 based on Dante's Inferno, this year's Blawg Review of the Year, you might be encouraged to review all the Past Issues of this our first year. They're all so very good. And, as interesting as it is to read Blawg Review every Monday, maybe it's time to make a New Year's Resolution to join in the fun with other lawyers, law students and legal scholars who blog, as a regular contributor to our weekly linkfest and, may we suggest, as a host of Blawg Review on your own law blog. For a few of these Blawg Review Awards there were other deserving blawgs, and I see some excellent law bloggers were overlooked. You know who you are. Sometimes justice seems blind, or simply gets it wrong, but what could I say to a superheroine lawyer who's such a freakin' goddess? 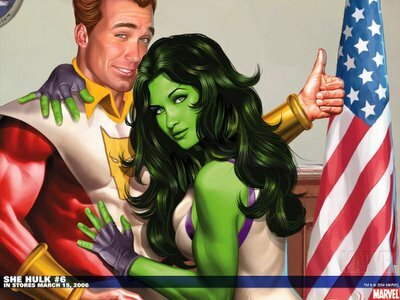 Marvelous News—She-Hulk Returns to Practice Marvel Law. Jennifer Walters always thought being a criminal defense attorney was in her blood...until a gamma-irradiated blood transfusion gave her the ability to change into the world's sexiest, sassiest, and strongest superheroine -- the She-Hulk. Join Marvel in celebrating 25 years and 100 solo issues of She-Hulk in this hundred page special! Get ready for the most important case in She-Hulk's life because SHE'S the accused! Charged with crimes against the space-time continuum, the TVA is placing She-Hulk in a Time Trial. If she loses? Her entire personal history-- her very existence could be erased right out of the Marvel Universe! On Sale December 29th, She-Hulk #100 with cover by Greg Horn.